BIML – What is it? I’ve noticed a growing trend over the last year – the ever growing presence of BIML (Business Intelligence Markup Language). So what is it? What does it do? And do you need to learn it? Simply, it’s a way of defining the functionality of an SSIS (Integration Services) package. If you’ve ever opened an SSIS .dtsx file in notepad you’ll see a daunting mess of GUIDs that you really don’t want to play around with. BIML is a simple XML format that allows you to write an SSIS package in notepad. When you run a BIML script it creates SSIS packages for you. These can then be opened and edited in BIDS exactly the same as an SSIS package that you’d created manually. The BIML script is a little easier to digest! But why on earth would you want to do that, when you can just use the BIDS/Visual Studio GUI? The answer is C# and automation. 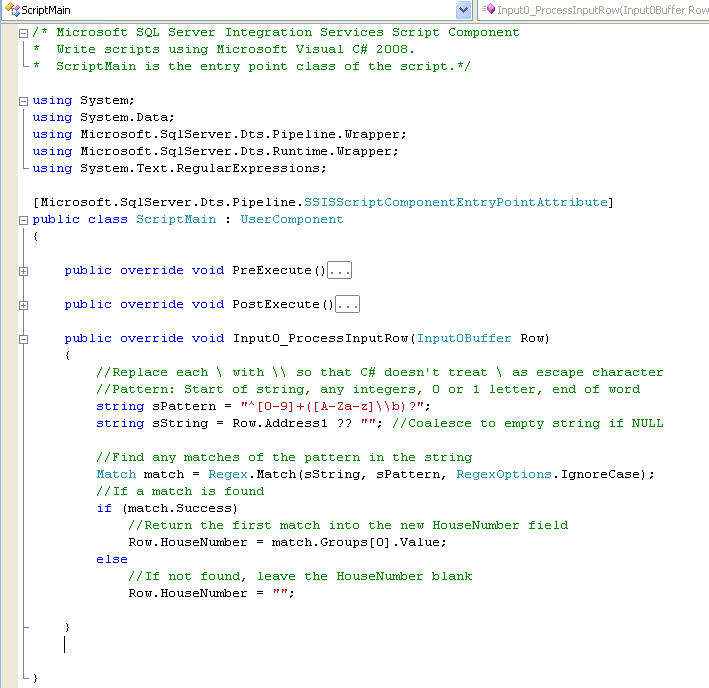 You can mix C# code in with the BIML XML (in a similar way to PHP or old school ASP scripts). This allows you to have a single BIML script, which can apply itself to every item in a list, or every table in a database, and automatically generate all of your SSIS packages from a single template. Yes, this is very cool stuff. The following screenshot is the same script as above, but configured to loop through every table in the ‘dim’ schema of a data warehouse, creating a package that truncates the relevant dim table. The C# script is highlighted in yellow for clarity. 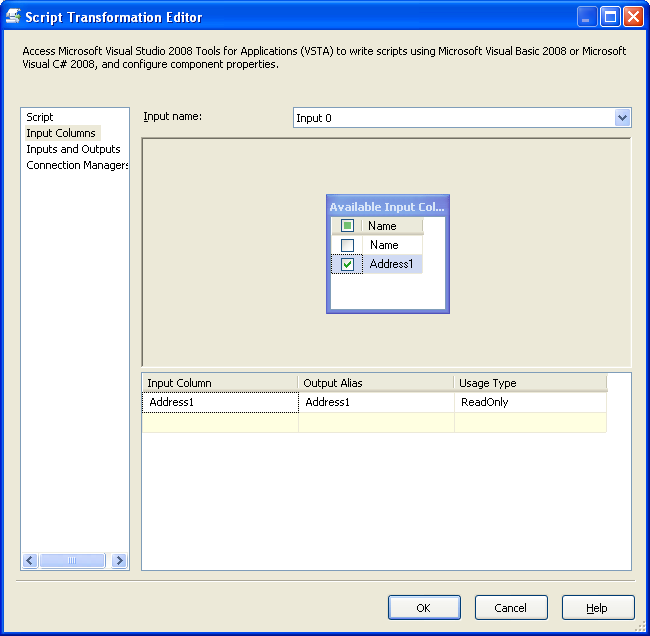 With this, just running the script will create multiple SSIS packages at the click of a button. How do you create and run a script? Firstly you need BIDS Helper. But you should have that anyway. This will add a BIML script file into the Miscellaneous folder of the project. Once you’ve written a script you can test it (right click on the script and select ‘Check Biml for Errors’, or you can run the script, generating the SSIS packages, by clicking ‘Generate SSIS Packages’. So, do you need to learn BIML? I have no doubt that BIML is the future of SSIS. Once you see the full power of if then you’ll never want to go back to manually coding packages again. If you’re an SSIS pro then there’s a good chance that your next job will require BIML. Or if a potential employer doesn’t ask for it, you can certainly improve your chances of getting the job by selling it (and your skills) to them. At Purple Frog, all of our SSIS development is now 90% automated using BIML, leaving us more time to focus on the 10% of work that need some custom tweaking or more enhanced logic. What if you don’t like coding? Well in that case, check out MIST from Varigence. It’s a GUI for BIML, and a lot more besides. If you’re going to be using BIML a lot then it may well be worth the investment. 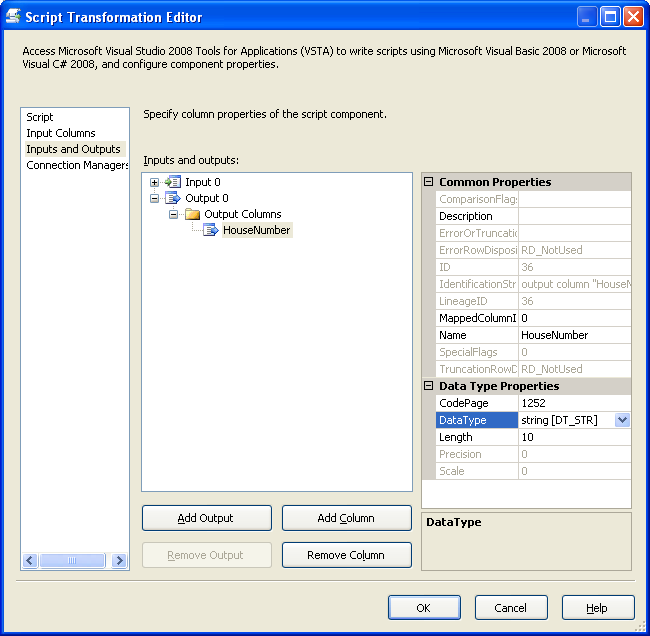 One of my favourite features of SSIS is the script component, and I know I’m not alone. Why? Because it brings the entire might of the .NET framework to SSIS, providing C# (in SQL 2008 onwards) and VB.NET extensibility for all those times where SSIS doesn’t quite have enough functionality out of the box. Well a problem I’ve come across a number of times is string parsing. Trying to search for and extract a specific pattern of characters from a larger text string. I’ve seen developers build crazy convoluted expressions in the derived column transform, some of which are very impressive in their complexity! This is a bad thing not good, although it shows a level of prowess in building SSIS expressions (not the most intuitive expression language! ), it becomes a support nightmare for other developers. The .NET framework includes full support for regular expressions (Regex), in the System.Text.RegularExpressions namespace. Regex provide an incredibly powerful way of defining and finding string patterns. They take some getting used to, but once you get the hang of them you can unleash their power in your SSIS dataflow pipelines. Let’s take our first example from above, extracting a house number, converting “29 Acacia Road” into “29”. The first thing we need to do is define our Regex search pattern. In this case we know that it must be at the start of the string, and must be an integer, with any number of characters 0-9. + means 1 or more of the preceding item. i.e. 1 or more integers at the start of the line. We should also add “\b” to the end of this, which indicates a word boundary. This means that 221b should be a whole word, not part of a larger sequence “221BakerSt”. We can wrap up the [A-Za-z]\b together into brackets so that the ? applies to the combination, so that any single letter must be the end of a word or it will be ignored. In this way “221BakerSt” will return 221, as will “221 Baker St”, whereas “221B Baker St” will return “221B”. You’ve probably gathered by now that regular expressions can get quite complicated. I’m not going to go into any more detail about them here, but hopefully this gives you some idea of what they can do. There’s plenty of reading on the web if you want to know more. You should also make use of the Regex expression tester in the link above – it will save you lots of debugging! How do we use Regular Expressions in SSIS? Well it turns out this is the easy bit, with the help of the script component. 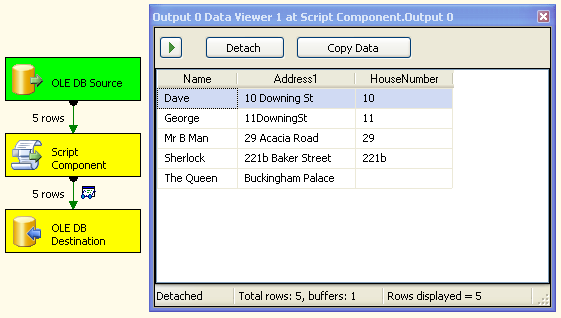 Open the script component and select the input field from the “Input Columns” screen, in this case “Address1”. This can be ReadOnly. Go to the “Inputs and Outputs” screen and add an output column to “Output 0”. We want to set the datatype to string, length 10. This new field will contain the results of our Regex pattern matching. Click on “Edit Script” on the Script screen which will open up Visual Studio. Then place the necessary code in the Input0_ProcessInputRow function. When you save and exit the script, any component downstream of the script component will have access to the new HouseNumber field. When developing SQL Server Reporting Services (SSRS) reports, BIDS caches the query results when you preview the report. This cache is then used next time you run a preview. This has the benefit of speeding up report development, but it does cause a problem when you want to test changing data. A simple way of forcing the cache to refresh is to open the folder containing the .rdl report files, and delete the corresponding .rdl.data files. The next time you preview the report SSRS will be forced to requery the source. To save time, I use the following macro to take care of it. Press ALT+F8 to open the Macro Explorer, and add a new module called “RemoveRDLDataFiles” under MyMacros. Edit the file and add the following code to the file. (This is for SQL Server 2008, you may need to tweak the references for 2005). You can then run it by either double clicking on the macro, or assigning a keyboard shortcut to it (via Tools, Customize, Keyboard).